The Kuril islands, extending from north to south for 1200 km, are a part of the submarine uplift located between the Sea of Okhotsk basin and the Kuril oceanic trench. The archipelago comprises 30 large islands and numerous small ones. Two sectors, different in the history of development and morphology are distinguished within the archipelago (Luchitsky, 1974; Piskunov, 1987). The inner arc, known as the Greater Kuril, extends from Shumshu island to Kunashir and the outer arc, termed the Lesser Kuril, which includes Shikotan and the small isles of the Habomai group (Figure 18.7). Tectonically the Kurils belong to the Kuril-Kamchatka island arc which is related, as all island arcs, to an oceanic trench located 150-170 km from the volcanic front. Pronounced seismic activity is associated with the arc and the Benioff zone can be traced to a depth of 650 km (Tarakanov, 1972). The Greater Kurils and the Lesser Kurils differ in their morphology, geological structure, and history of development. The Lesser Kurils, as well as the submarine Vityaz uplift to which they are connected and the peninsulas of eastern Kamchatka, are interpreted as an outer non-volcanic arc of the Kuril-Kamchatka system. The Lesser Kurils are formed mainly by late Cretaceous volcanic rocks. Volcanism of a submarine nature, as a result of which the islands emerged, was active in the Campanian (85-80 Ma BP) and the geological complex of this age is represented mainly by basalts. In the Maastrichtian (73-65 Ma BP), volcanic activity faded and flysh with olistostromes accumulated. Volcanic activity of the time was represented mainly by magmatic intrusions into sediments (Piskunov and Sergeev, 1992). At the end of the Cretaceous, volcanism occurred in terrestrial conditions. The completion of the magmatic activity was marked by gabbro intrusions. At present, there are no active volcanoes in the Lesser Kurils. The ancient calderas have been eroded and gentle hills with a height of 150-250 m dominate the islands. The Greater Kurils are a younger formation where volcanism commenced at about 30 Ma BP in the late Oligocene-early Miocene. There were three major stages of arc development and these are reflected in the sequence of Cenozoic rocks (Fedorchenko et al., 1989; Piskunov and Sergeev, 1992). The most ancient rocks of the lower Miocene age comprise basalts, andesites, rhyolites, and their tuffs. The latter are abundant and can be correlated with the Green Tuff Formation of Japan. During the next stage in the middle Miocene, volcanism occurred mainly under terrestrial conditions and the stratigraphy is characterized by the occurrence of both volcanic rocks and flysh-type sequences. Clastic material contains rocks which are not found in the Greater Kurils and which have apparently been derived from the dissected terrain in the back-arc area. The composition of these sequences shows that the Sea of Okhotsk basin did not exist at the time, while their inclined position reflects block rotation along faults during rifting and the opening of the Sea of Okhotsk basin at about 15 Ma BP (Zonenshain et al., 1990). The latest stage, during which the modern volcanic cones emerged, began in the late Miocene and is continuing at present. Its geology is a typical cal-calkaline volcanic sequence. Similarly to Kamchatka, there were major periods of enhanced volcanic activity in the Kurils in the late Pleistocene and early Holocene (e.g., the Medeleev and Golovnin calderas formed 38-40 Ka BP). Over a hundred terrestrial volcanoes occur on the islands at present and 39 of them are active. The most active volcanoes are the tallest Kuril volcano, the Alaid (2339 m) located in the north of the arc and the Sarychev located on Matua island. The last powerful eruption of the Alaid occurred in 1972 when a new slag cone 150 m high formed in the centre of the volcano. The Sarychev is known for its regular activity. The most violent eruptions occurred in 1930 and 1946 when the ashfalls reached central Kamchatka. By contrast, another major volcano, the Golovnin caldera (the southernmost Kuril volcano located in Kunashir island) has not erupted for more than a century although it accommodates geothermal springs and two large lakes formed 640-680 years BP (Razjigaeva et al., 1998). Typical of the Kurils is low to middle mountainous relief with altitudes of 500-1300 m. Five major morphological types of relief are distinguished: volcanic, seismo-tectonic, erosive-denudational, coastal (of abrasion and accumulation types), and aeolian (Grabkov and Isachenko, 1982). Aeolian forms date back to about 4.5-4.7 Ka BP when an extensive marine regression occurred (Bazarova et al., 1998). Most islands have volcanic relief and the landscape is that of individual volcanoes or volcanic ridges linked by sediment-filled isthmuses. Six to seven marine terraces occur in the coastal zone with altitudes ranging between 2-3 and 200-250 m a.s.l. Both marine terraces and volcanic massifs are strongly dissected which indicates a high rate of erosion and marine abrasion. The landscapes of the Kuril islands were formed under the influence of two major factors: volcanism and seismic activity, and climate change. Climate is strongly influenced by the physical and chemical properties of the ocean, such as sea surface temperature and salinity, and variability in the paths of the oceanic currents may result in regional climatic change. Periodic changes in ocean circulation patterns due to changes in trade wind intensity in the eastern equatorial North Pacific Ocean and movements of the ocean plate have been discussed in relation to the warm Kuroshio current and climate change in Japan (Taira, 1980; Sawada and Handa, 1998). The islands of Japan and the Kurils are located in close proximity (as early as in the middle Holocene the islands of Hokkaido and Kunashir were connected by a landbridge) and climatic and environmental changes in northern Japan and the southern Kurils are closely correlated (Bazarova et al., 1998). However, the paleooceanography of the Kurils and its impact on the landscape development require further independent investigation. The large latitudinal extent of the Kuril arc and a difference in summer temperatures precondition the development of latitudinal zonation. However, this is strongly disrupted by the mountainous relief and volcanic activity. In all, there are about 1000 higher plant species in the Kurils but only about 100 are widespread and not more than 20 have a community-forming part (Vorobyev, 1963). Of the latter, Sasa kurilensis, Pinus pumila, and Betula ermanii are most common. The Kuril flora is made up of species that are also found in Japan, Sakhalin, the Maritime Province, Kamchatka, and North America. South of Urup island, Japanese species prevail while the Kamchatkan species are more common to the north. Perhaps as a result of catastrophic volcanic eruptions there are gaps in the distribution of some species: many species which are found in the south do not occur in the north but reappear in Kamchatka. The northern Kurils (from the island of Shumshu to Ushishir; Figure 18.7) have open landscapes, and a simple vegetation structure and flora, which may be described as being of greatly impoverished Kamchatkan type. The foothills are covered in thickets of Alnus kamtschatica and Pinus pumila. At an altitude of 300-400 m, these are succeeded by heaths and communities of dwarf shrubs such as Rhododendron aureum, Empetrum nigrum, Arctostaphylos alpina, and Vaccinium spp. The highest parts of the volcanic slopes host fragmented mountainous tundra communities. Only one island, Shumushu, does not have active volcanoes. It is flat, swampy, and covered in sedges and grasses. The central Kurils (from the island of Ketoi to Urup; Figure 18.7) are dominated by the Betula ermanii (one of the few tree species capable of tolerating low temperatures, high humidity, and strong winds) forests with an admixture of Sorbus sambucifolia and Alnus maximowiczii and Sasa kurilensis in the undergrowth. Higher along the volcanic slopes, Alnus kamtschatica and Pinus pumila dominate and are succeeded by heaths and dwarf shrubs and the mountain tundra communities. 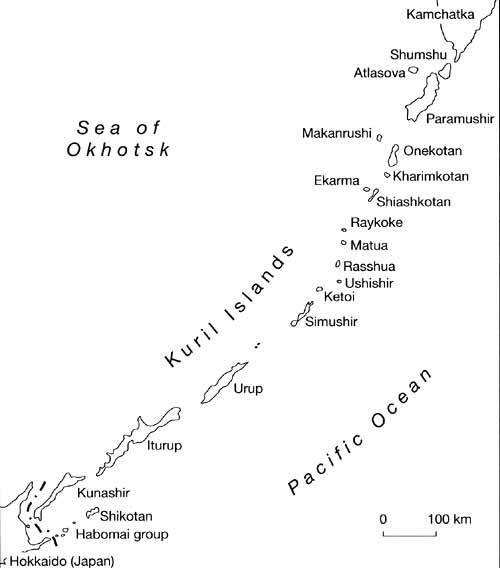 The southern Kuril geobotanical region includes two large islands, Iturup and Kunashir (Figure 18.7). A warmer climate preconditions the development of dark coniferous and mixed forests which have many Manchurian species (especially on the western side of the islands where climate is ameliorated by the warm Soy current). Thus Kunashir forms the northern boundary of the distribution of such species as Magnolia obovata, Picea glehnii, Alnus japonica, and Quercus dentata (Alekseeva, 1992). Dark coniferous forests, composed of Picea abies, P. glehnii, and Abies alba occur on the lower 400 m of the mountains (Figure 18.8), being particularly widespread in Kunashir where they occupy about 60 per cent of the area. Often such forests have a multitier structure: coniferous species form the first tree tier; the heat-loving broad-leaved trees (e.g., species of Quercus and Ulmus) form the second tier; and Sasa kuriknsis forms the undergrowth. Mixed and deciduous forests are typical of Iturup and southern Kunashir. About 80 per cent of Iturup is forested and deciduous forests occupy 50 per cent of the territory with Quercus crispula being a dominant species. Coastal areas and river valleys are dominated by tall-grass meadows of the Kamchatkan type (formed by Cacalia hastata, Angelica ursina, Filipendula kamtschatica, and Fagopyrum sachalinense) and Sasa kuriknsis communities. Similarly to Sakhalin, Sasa kurilensis forms secondary successions in forest fellings preventing the regeneration of forests. 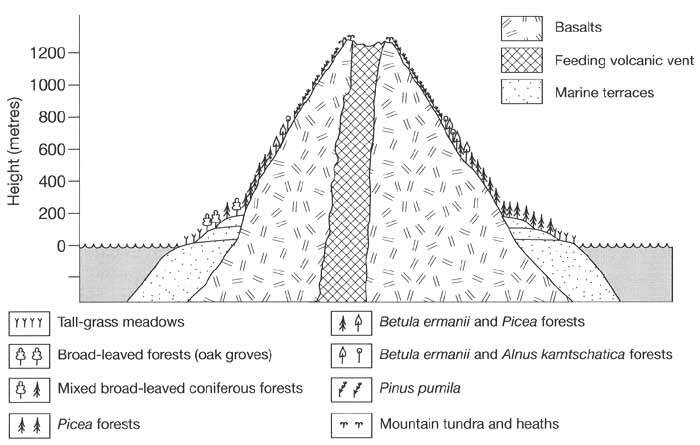 Higher on the slopes, coniferous and mixed forests are succeeded by Betula ermanii woodlands, Pinus pumila thickets, heaths, and above 1000 m by sparse grass communities on the talus slopes (Grabkov et al., 1986). The flora of the Lesser Kurils is distinguished by the absence of Pinus pumila and the limited occurrence of Sasa kurilensis. Instead, Juniperus sargenti communities and oceanic meadows are widespread and coniferous forests composed of Abies sachalinensis and Larix kurilensis develop particularly in the island of Shikotan. The fauna of the Kurils is not rich but it combines southern species from eastern Asia with boreal and subarctic species which gives it some originality (Voronov, 1992). Terrestrial mammals are mainly linked with forests: brown bear, wolves, foxes, sable, and squirrels. Foxes have been introduced from the Komandorskiye islands and are now ubiquitous especially in Ushishir, which is known as the 'island of foxes'. Perhaps the most distinguishing feature is the abundance of sea mammals which form beach colonies in many islands. In addition to the Stellar sea lion and common seal, widespread in the northern Pacific, there are colonies of two rare species, northern fur seal and sea otter. The Kurils lie on one of the major migration routes of birds nesting in Kamchatka, Chukchi peninsula and Alaska. More than 170 bird species are known in the Kurils and most of them in the southern islands (Shuntov, 1995). Marine birds are particularly common and form extensive colonies on the coastal cliffs. The Kuril's nature has been little changed by human activities. With a total population of only 25 000, environmental disturbance is limited to the major settlements (Kozynuk, 1992). Most of the islands are uninhabited and permanent settlements are located on the islands of Shikotan, Kunashir, and Iturup in the south and Shumshu and Paramushir in the north. The extraction and recycling of marine biological resources is the main industrial activity. Small-scale agriculture exists in the southern islands and there is very limited timber production in Kunashir. The unique and unspoiled nature of the Kurils offers great potential for the development of ecotourism which is becoming an increasingly popular activity. This, however, is limited by the absence of a recreational infrastructure (Ivanov, 1995).